MMA Fight of The Year Nominees Part 4 | MMA Fighting Events Videos Techniques UFC Fight Picks and News. As the end of 2010 nears, it's time to nominate another MMA fight for our MMA Fight of The Year series. This nominated MMA fight took place between Kazuo Misaki and Jorge Santiago at SRC 14. It was a rematch for the SRC middleweight title. 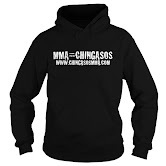 This fight is nominated for the twist and turns the fight took, as well as the cornucopia of chingasos and submission attempts throughout the fight. Check out the video where the fight is picked up in the fourth round.